Thought is of the compound interetheric subdivision and active within the interetheric subdivision. "The centering conscious Mind of man's Soul-will alone thinks by projecting desire for creative expression through the brain machine. "Desire in Mind is electrically expressed. 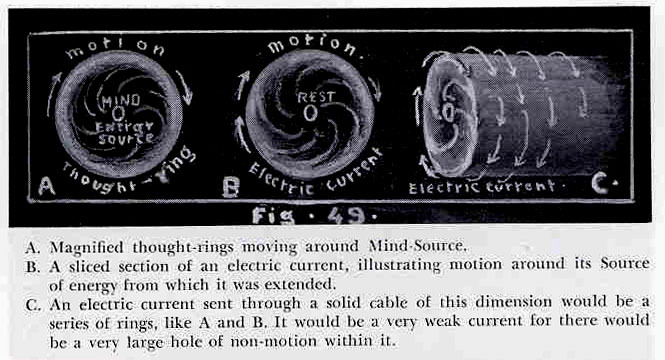 Electricity is the motivative force which projects the One Light of Mind two ways to create cycles of light waves for the purpose of expressing thought cycles. "God's Thoughts" refers to us. We are the Thoughts of God, and Creation is "the sum of all God's Thoughts," the sum total of all beings of all time. "The Course makes an amazing assertion here: "God's Thoughts are given all the power that their Creator has." In the Bible it is recorded that Jesus said, toward the end of his life, "All power is given to me in heaven and in earth." The Course says all power is given to us as the Sonship, not just to Jesus. What this is saying is that, what God can do, we can do. We are simply His extensions. Therefore, as He creates, we create also. "Those experiences are wonderful, and asking for them is not discouraged in the Course. But the main thing to realize here is that Creation, as the Course talks about it, is not an experience on earth; it is an experience in Heaven. It is something that is always going on, and our dream of separation has not interrupted Creation at all. Nothing has been lost or stopped by our illusion of separation. That is why the Course can tell us, as in last week's topic (Last Judgment), that the final judgment on this world is, "It is meaningless and does not exist." "There is a borderland of thought that stands between this world and Heaven. It is not a place, and when you reach it it is apart from time. Here is the meeting place where thoughts are brought together; where conflicting values meet and all illusions are laid down beside the truth, where they are judged to be untrue. This borderland is just beyond the gate of Heaven. Here is every thought made pure and wholly simple. Here is sin denied, and everything that (is) received instead. "This is the journey's end. We have referred to it as the real world. And yet there is a contradiction here, in that the words imply a limited reality, a partial truth, a segment of the universe made true. This is because Knowledge makes no attack upon perception. They are brought together, and only one continues past the gate where Oneness is. Salvation is a borderland where place and time and choice have meaning still, and yet it can be seen that they are temporary, out of place, and every choice has been already made. "Thought, like the blossom of the rose or tree, contains all the elements of the tree or rose. Now as the law of vegetation governs the tree or rose, so the law of mind acts upon the idea or spiritual tree, known by the name of good or evil. Now although this tree differs from all other trees in the garden of man, it cannot be detected except by its fruits, and as the fruits appear pleasant to the eye of the mind and are supposed to make men happy, it is cultivated without knowing the peculiar properties it contains. "Now as this tree grows it sends forth its thoughts like blossoms, and as it is looked upon as a fruit much desired to make one well, it is received with joy and cultivated in the garden of our minds. Now in the beginning of the creation of man this tree was a tree that differed from all others in men and was very like the tree of life. The fruits of this tree have been the foundation of all the philosophy of man ever since man was created. "Now as man's natural body contains the soil for this tree to grow, as the earth is the soil for the rest of the trees and herbs and creeping things that have life, it is the duty of man to investigate this tree and see what its fruits contain. The tree is to be known by its fruits. This tree is an idea like all other ideas in man, but differing in one peculiarity, happiness and misery. All the rest of the trees of knowledge contain right and wrong without any regard to happiness or misery. This is the difference between the trees. "Now as this tree can bear the fruits of other trees, it is another reason for its being cultivated, but to understand the tree or idea is to understand its fruits or thoughts. "I shall now call this tree an idea which contains happiness or misery and also truth and error. Now as error, like the serpent, is more subtle than any other idea in man, it acts upon the weaker portion of our thoughts and ideas and engrafts them into the idea of happiness and misery. Now as this idea grows and sends forth its fruit, it is conveyed by error to other trees or ideas in others, and thus spring up false theories, false doctrines, etc. Now as this tree or idea sends forth such a variety of thoughts or fruit, it is like Joseph's coat of many colors, hard to tell what was the original color or idea. This throws man into darkness and doubt and he wanders about, like a sheep without a shepherd, running after false ideas. Being blind, he is not capable of judging for himself and suffers himself to be led by the blind. "Who had ever suspected the human mind could be so highly creative, that a strongly-held thought or desire would actually manifest itself in the visible realm? I realized that Moses must have known something of this, because he had accomplished some strange things when the Israelites were in dire need. "PURPOSE is entirely different to INTENTION since purpose comes down from the mental plane of intention and becomes an emotional drive, a desire to formulate 'a means to achieve the intended end'. "Remember, at all times, that what you THINK about is what you are tuning into. "Your thoughts are 'searchlights' making contact with what you seek. "Remember that every 'thought' has its own frequency of vibrations in consciousness. Believe, know this, for this is true. The more spiritual the thought, the higher the frequencies of vibration. 'Consciousness forms' embodied by words are not visible but are 'specific entities of being'. "They have the life of consciousness within them. They are magnetised to like 'consciousness forms'. Like is drawn to like.